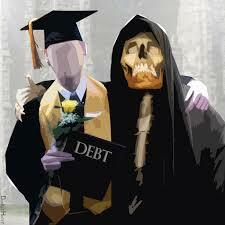 Student debt bubble; should school loans be repaid, or not? If individual students were mini-corporations, its credit worthiness would be much lower; debt burden is dramatically higher and the income opportunity in today’s job market simply hasn’t kept up, at least on a collective basis. Returning to fairness, this will be an impossible riddle to solve. There is no debt amount or set of collective circumstances where some should repay loans and others should not. The cost of forgiveness falls back to all of society vis-a-vis taxation and/or crowding out of other government programs. The determination on who should experience debt forgiveness is subjective. A doctor who works harder in school, and studies longer, should not be made eligible for complete forgiveness because her debt balance is large? What about students who chose to major in Mossi (language of Burkina Faso) and can’t get a job using this skill in the US? Should ultimate contributions to society matter? Who would determine what is a contribution and what isn’t? How would this be measured? It’s abundantly clear, means testing for student debt forgiveness is a walk through a murky bog. The Obama Administration apparently has considered wiping away debt after 20-years – reflecting an aim to have no one be repaying school debt for an “entire working life”. Sounds good on the surface, but what about those who chose to forgo university, its social status, and higher lifetime income benefits? These workers might be stuck with low wages over an “entire working life”. Should uneducated workers get hit with higher taxes or less government assistance in order to fund school loan bailouts? The fairness question is complex. CJF is fervently pro-education, though education can be academic or in the form of learning a trade/tangible skill-set. An educated population undeniably leads to economic advantages and better social harmony. But who should shoulder the burden when things don’t go as planned? Student loan debt burden is another speed constraint on economic growth. It’s generally easy to generate growth in a period of leveraging up but harder to sustain growth when debt can be expanded no more or, gasp, it needs to be reduced (think Europe). The Federal Reserve Board estimates $13.2 trillion in mortgage debt – the sheer size of mortgage debt outstanding led to the inevitable nature of the financial crisis once these loans went upside down. The good news is mortgages are better collateralized by the national housing stock, which bottomed in terms of valuation a few years ago. Non-mortgage consumer credit is $3.1 trillion. Revolving credit is less than $1 trillion. Non-revolving credit is $2.3 trillion. Motor vehicle loans are $900 billion. Student loans are $1.2 trillion (as estimated by the Federal Reserve Board). 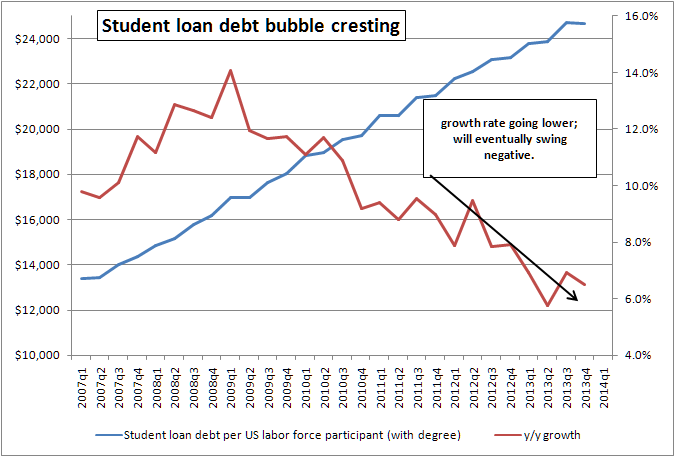 The extent of the bubble becomes obvious when breaking out the amount of student loans outstanding per member of the workforce – this data has almost doubled since 2007 when reliable statistics are available. Returning full circle to the genesis of the problem, the cost of a university degree is growing at an unsustainable pace. The hint of additional debt forgiveness acts to make borrows less price sensitive, not more so. A change in market forces is required; students need to become more cost-benefit aware when making educational decisions. At one point, the responsibility for this was on the individual. Today the responsibility for educational funding, and student debt is less clear, and this distortion may incentivize continued price-insensitive behavior. Why not attend the most expensive school if you might not need to pay it back? Questions of fairness on this issue will persist for many years to come and impact all taxpayers and society. 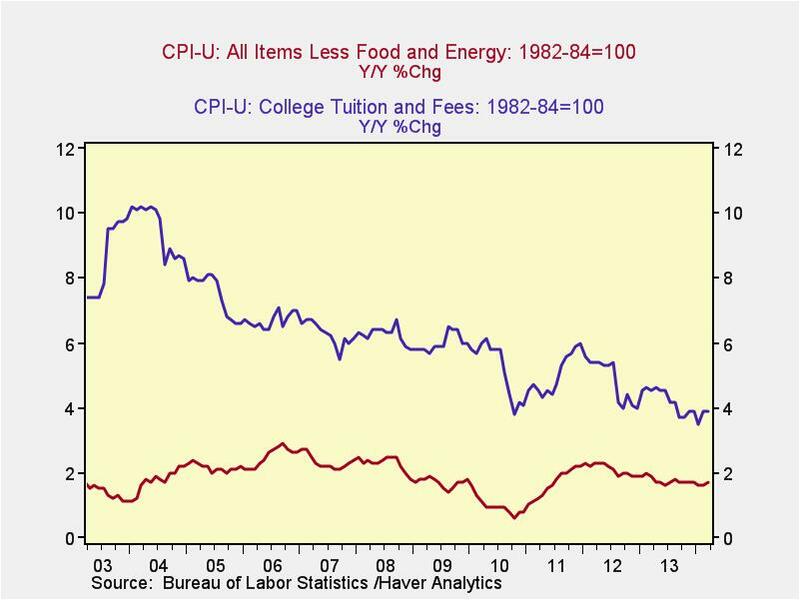 Prices for college tuition and fees go up at double-triple the pace as everything else! This is one trend which is certain to change now that student debt burdens are stretched too far, and the costs of bailouts being evaluated by policy makers.